Light Up the Holiday Season! The holiday season starts off before you can finish eating all of leftovers from your Thanksgiving meal. The dark sky is ablaze with festive lights. Here are a few ideas to get into the holiday spirit. 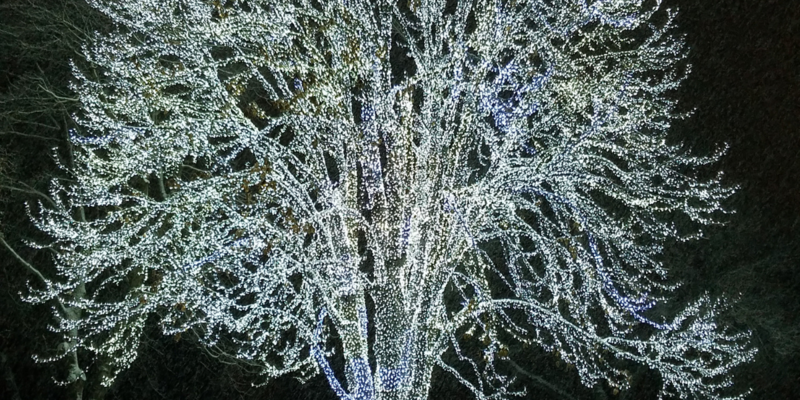 Draper City Park Tree Lighting Ceremony – Monday, November 26, 2018 6:00 PM to 8:00 PM. Draper City Park 12500 S 1300 E. Festivities include lighting the Tree of Life, music and a visit from Santa. Lights on Wakefield’s Lighting Ceremony – Friday, November 23, 2018 Lights will be turned on at 7 PM. 6388 S Wakefield Way (5885 West). 60,000 light display in tune to music. Keep your radio tune to 87.9 FM. Light Display runs nightly until New Years. Free event, but donations are gladly accepted for the Mascot Miracles Foundation. Midway Town Square Tree Lighting Celebration – Saturday, November 24, 2018 from 6 PM – 7 PM Enjoy cookies, hot cocoa and have photos taken with Santa and Mrs. Claus. Ogden Electric Light Parade – Saturday, November 24, 2018 5:30 PM. Parade of lighted floats and performers on Washington Blvd, from 22nd Street to 26th Street. Santa arrives on the final float of the parade and flips the switch to light up Christmas Village at the Municipal Gardens. Park City Electric Light Parade – Saturday, November 24, 2018 beginning at 4:00 PM. Santa and holiday carolers can be found strolling along Main Street. At 5:30 PM the Main Street lights and the Christmas tree in Miner’s Park will be turned on. The Electric Parade arrives on Main Street at 6:00 PM. Spanish Fork Winter Lights Parade and Tree Lighting Ceremony – Friday, November 23, 2018, lighted floats parade on Main Street beginning at 7 PM. The Jingle Bus is a free bus service for visitors to downtown Salt Lake City. Jump on board the Jingle Bus for rides to the Gateway, Temple Square, City Creek Center, Gallivan Plaza and the Capitol Theatre. Volunteer hosts provide fun facts about downtown as riders enjoy seeing the holiday lights and decorations in the city. The Jingle Bus runs 7 days a week from Friday, November 23rd to December 31st (except Christmas day) from 5 to 10 PM. Candy Cane Hunt – Monday, December 10th, 2018 4 PM. Draper Historic Park 12625 S. 900 E. Hunt for thousands of candy canes will be hidden in bushes and trees and scattered around the park. Look for the specially marked candy canes which can be redeemed for toys. Santa will arrive by fire truck. He will be available for visits with the children under the Christmas lit gazebo where you can take your own photos for free.